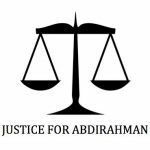 Here are 3 quick and easy ways to support the Justice for Abdirahman Coalition. You can show your support by way of a letter of endorsement. An endorsement letter indicates your support for the Coalition’s objectives and spirit. Conclude by reiterating your support and summarizing why your support matters! Don’t have time for writing a letter? Sign our Endorsement Statement! With just a few clicks you can quickly become an Official Supporting Partner. Use the change.org link to sign our Endorsement Statement as a private citizen or as an organization. 2 – Join our mailing list – Events, Calls to Actions and Info sharing! – By joining our mailing list you will be made aware of events and requests the Coalition sends out. You can support the Coalition’s ongoing efforts by participating in events, responding to calls for action and sharing the information on to your networks and social media. Please email us: info@justiceforabdirahman.ca to join the mailing list. The recommendations put forward by the Coalition require political will to action them. As such you can do a tremendous act of support by emailing YOUR elected official and demanding action on the recommendations. We have made this process super easy for you. Click here to quickly send your email. All you need is 30 seconds, your name and your email address!